A train company in Taiwan has complained to Warner Bros for allowing an "unauthorised passenger" on one of its trains, it is reported. The passenger in question was Annabelle, the "demon doll" from US horror film Annabelle: Creation, which hit the box office on the island earlier this month. According to the United Daily News, Taiwan's High Speed Rail (HSR) complained to the entertainment company after seeing pictures of the doll riding on one of its trains on a Warner Bros Facebook page. HSR spokesperson Chung Jui-fang told the paper that the doll had "violated regulations", as anyone who wished to film or take photographs on their trains for commercial use was required to fill in an application form asking for consent. Warner Bros has since removed the photographs from its social media pages, saying they were provided by a third party. According to Taiwan News, the entertainment company's legal team "has begun working to resolve the issue". Many on social media are praising the privately-owned train company for challenging the images, with one Facebook user saying "asking for an apology is very reasonable". 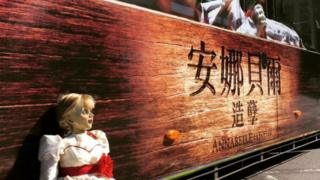 "The focus should not be on Annabelle, but on the HSR being used for commercial marketing," says user "Bau Rong Rinn". "If you're filming or doing marketing activities in Starbucks or McDonalds, you have to get the company's permission, right?" Still, some users are surprised. "It's just a doll, what are they so worried about?" asks "Dingo Whiz". "Sling Yap" adds that "public reaction was great" when the doll made an appearance on a train in Malaysia earlier in the month.